Why do all gothic mansions have to be haunted? Because they’re just creepy, that’s why—especially if you’re forced to live there with some creepy step-father. 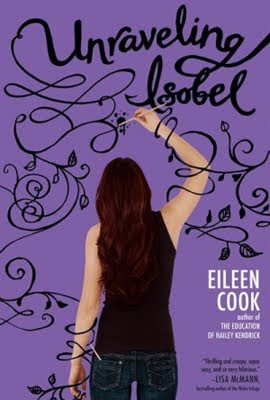 That is why you must read GCC Member Eileen Cook’s new book, UNRAVELING ISOBEL, out this month through Simon Pulse. Eileen: I happen to be one of those people that other people like to have in their wedding. I think they’re counting on me to provide the comic relief. I’ve been a bridesmaid around a dozen times. Most of the dresses were pretty decent (how’s that for lucky?) but one of them was a shamrock green color that made me look like I was getting over a raging case of malaria. Eileen: I don’t tend to base my characters on any real people, but I do steal little details here and there, the way someone dresses or a quirky habit. One of the best things about being a writer is the chance to people watch all the time and daydream and get to call it work. I have to go to the coffee shop and listen in on other conversations- it’s research! Eileen: The hardest thing for me was finding my agent. The biggest reason was that when I first started looking, I wasn’t actually ready. I thought I was ready. I was sure the book I had written was genius! It was only after every living soul who worked in publishing shot me down that I realized that maybe the book wasn’t as good as I thought. I went back to work and wrote another book, Unpredictable, and that became my first published book. I’m very lucky in that I work with a great team at Simon Pulse. I had recently finished my book, The Education of Hailey Kendrick. I was having lunch with friends and my agent called to tell me that my editor was offering me a two-book deal for whatever I wanted to write next. I didn’t even have a story idea yet. I was thrilled. I convinced my friends to join me for a celebration! Thank you, Eileen! Now, everyone go out and buy books, lots and lots of books!